A physician of the thirteenth century. He was court physician to King James I. of Aragon, and in that capacity was present at the conquest of Majorca, where he rendered valuable service as interpreter between the Arabic-speaking Majorcan Moors and the conqueror, who understood only the Limousin dialect. In the dispute concerning Maimonides' writings, Baḥiel made himself by his zeal the leading representative of the philosopher's defenders. In 1232 he wrote the appeal to the Jewish congregations of Aragon to recognize the excommunication pronounced upon Solomon ben Abraham of Montpellier and his associates. Brother of the preceding; was also a physician and interpreter in the suite of King James I. He was the author of the Arabic proclamation in which the Moors were notified of the conquest of Majorca and summoned to acknowledge their submission ("Chronica del Glorios. e Invict. Rey En. Jaeme," Valencia, 1557, xl.). In the Maimonidean controversy Baḥiel sided with his brother. He died in 1264. 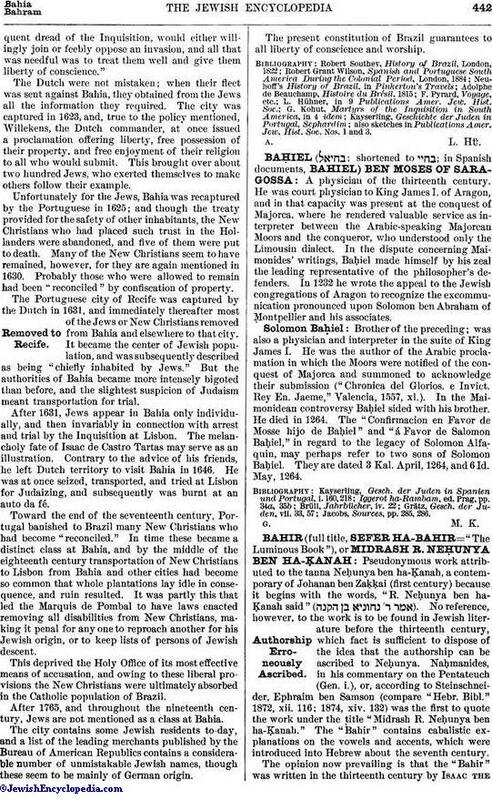 The "Confirmacion en Favor de Mosse hijo de Baḥiel" and "á Favor de Salomon Baḥiel," in regard to the legacy of Solomon Alfaquin, may perhaps refer to two sons of Solomon Baḥiel. They are dated 3 Kal. April, 1264, and 6 Id. May, 1264. Jacobs, Sources, pp. 285, 286.